Clean, exfoliate, nourish, and rejuvenate the skin with our professional facial treatments. Whether it's relaxation or corrective skin care, our skin care professionals are here to help! Professional facials and corrective chemical peels are essential for maintaining and restoring the skin’s health and appearance. By combining a customized at-home regimen with powerful professional treatments and targeted skincare solutions, the result is healthier skin with visible improvement in fine lines, wrinkles, and other signs of premature aging. Your skin care professional can help you determine an effective custom treatment program and product regimen for maximum results. Optimal for dehydrated, sensitive or stressed skin, this highly efficient, supple, sterile masque creates a protective barrier that helps alleviate discomfort. The unique fibers distribute heat-reducing water to the skin barrier to provide immediate relief for any skin type. Clinically tested on compromised skin after laser procedures and chemical peels, this masque can also be used as a bi-weekly replenishing treatment. A great addition to any facial service or purchase and take it with you to use at home! An exfoliating and emollient lip treatment to combat environmental damage. Hydrates to alleviate dryness and tightness and restores the lips for a smooth surface. A great addition to any service. Relaxing and nourishing medical-grade facial treatments that complement our corrective peels and in-office procedures to optimize the health and beauty of the skin. A customized facial treatment to best fit your personal needs. Great for the on-the-go client. We will perform only the “essentials” so that you can achieve maximum results when you don't have an hour to spare. Treatment begins with cleansing and prepping the skin and includes manual dermaplane exfoliation, a scrub exfoliation and/or masque, and application of a moisturizer and sunscreen to finish. Products used during treatment are selected based on your skin type and condition as well as your goals for optimal results. A soothing and cooling replenishment treatment great for the on-the-go client. After a dermaplane exfoliation, a soothing masque creates a hydrophilic protective barrier to help facilitate the recovery process and provide immediate relief for compromised skin. Deeply enriched with vitamin B5, this facial infuses dehydrated and stressed skin with hyaluronic acid and vitamin B5 to restore the skin’s optimal moisture balance for a radiant, healthy appearance. This treatment for congested pores exfoliates, detoxifies, and clarifies the skin. Designed to reduce oil without drying, this facial includes a deep cleansing and exfoliation followed by a clarifying masque to draw out impurities and intense hydration for a clear and brightened complexion. Reduce redness and inflammation and soothe irritation with a gentle exfoliation, soothing masque and calming botanicals for a replenished, healthier skin. Provides cooling, soothing relief for redness and flushing that often accompanies rosacea and problematic skin. Restores radiance and supports the skin’s resistance to future discomfort and sensitivity. Ideal for dehydrated and environmentally damaged skin. Formulated with vitamin C and amino acids, the vitamin C masque exfoliates skin and protects cells from free-radical damage while tightening, detoxifying, and restoring a firm, youthful, radiant complexion. A soothing and cooling replenishment treatment for compromised and environmentally damaged skin. Includes dermaplane exfoliation and a unique masque that creates a hydrophilic protective barrier to help facilitate the recovery process and provide immediate relief to the skin. Relax and enjoy a youthful, radiant glow after this facial. Features a dermaplane exfoliation followed by our most popular mild peel. A relaxing facial massage, calming masque, and neck and shoulder massage help to relieve tension and soothe stressed skin, while advanced stem cell therapy combats signs of aging. Learn more about our advanced Stem Cell Therapy products -- not all stem cells are created equal. Corrective chemical peels are often most effective when completed in series. For best results, a series of 4-6 peel treatments scheduled every 4-6 weeks is typically recommended. Custom peel programs are available. A customized facial treatment to best fit your personal needs. Great for the on-the-go client. We will perform only the “essentials” so that you can still achieve maximum results when you don't have an hour to spare! Treatment begins with cleansing and prepping the skin and includes manual dermaplane exfoliation, a scrub exfoliation and/or masque, chemical peel, application of a moisturizer and sunscreen to finish. Products used during treatment are selected based on your skin type and condition as well as your goals for optimal results. Designed to calm and correct acne-prone skin. Decongests and refines pores, reduces irritation, and helps control breakouts, while stimulating overall renewal. May also be done on the back or chest. Formulated with niacin, lactic acid, and usnic acid, this solution gently exfoliates all types of skin, decongests pores, hydrates skin, and improves visible signs of photodamage. A customized peel treatment that combines dermaplane exfoliation, chemical peel solution, corrective masque and relaxing massage to decongest pores, smooth out rough texture, fade signs of sun damage, and minimize the appearance of fine lines, wrinkles, and visible skin imperfections. A variety of peeling solutions can be used to target specific concerns to obtain optimal results for any skin type. This clinical-grade peel contains a highly-concentrated blend of salicylic and lactic acid with a maximized concentration of phenylethyl resorcinol. Targets hyperpigmentation and dramatically reduces discoloration associated with photoaging, hormones, and post-inflammatory hyperpigmentation, while smoothing texture and refining pores, to restore a brighter skin tone. The ProPeel is a four-layer, medium depth hydroxy acid peel that uses Jessner and TCA solutions with a vitamin A propionate. Developed for those seeking more dramatic results than achievable with superficial peels, this medical-grade treatment stimulates cellular regeneration and collagen synthesis to minimize the appearance of fine lines, aging, acne and acne scarring. The result is a more youthful appearance and improved skin tone and texture with minimal downtime. Extra strength peeling solutions stimulate cellular regeneration and collagen synthesis to minimize the appearance of fine lines, aging, acne and acne scarring. The result is a more youthful appearance and improved skin tone and texture with minimal downtime. Although our primary focus with all of our facial treatments is skin correction, relaxation is also an important part of our services. All of our full facial treatments typically include cleansing and prepping, dermaplane exfoliation, extractions, masque, relaxing neck and shoulder massage, application skin type/condition specific prevention and correction products, and application of a moisturizer and sunscreen to finish. Aromatherapy is also included if you like. Full facial treatments typically last 50 minutes to an hour. Our express facial treatments are 30-minute treatments designed for the on-the-go client. Express services are very treatment focused and client specific, so only the “essentials” will be done so that you can achieve and maintain results even if you're in a hurry. Dermaplaning, also known as epidermal leveling or blading, is a treatment to exfoliate the epidermis and also rid the skin of fine vellous hair (or what some may call “peach fuzz”). A sterile blade is used to remove the outer most layers of dead skin cells, leaving the skin soft and smooth. This method is both safe and effective, as our professionals are highly skilled and trained. This service is offered by itself or is included with any full facial treatment. Although most people love the dermaplaning service, you don't have to have it done during your facial treatment if you don't want to. If the skin is irritated or blemished, dermaplaning may not be done, as to avoid further irritation to the skin. No, don’t worry! Many people think that once you shave anywhere, the hair grows back thicker or coarser, but this is not true at all! There are two types of hair that grows on the body: vellus hair and terminal hair. Vellus hair, or “peach fuzz”, is thin and generally blonde or very light. Vellus hair is often found on the face, back, and stomach. Terminal hair, which is thicker and coarser, is usually found under the arms, on the legs, or on a man’s face. Your eyebrows would also be considered terminal hair. Once a hair is cut by shaving, it has a blunt edge, and sometimes this blunt edge can make it appear that the hair has grown back thicker and coarser when in fact, the structure of the hair has not been changed. The hairs are still the same; they just feel coarser because they feel “prickly” from being cut. Sometimes waxing can make it seem like your hair is thinner, but this is also not true. Because the hairs have been pulled by the roots, the new hairs grow with a softer feel. Again, the structure of the hair has not been damaged or altered, so the new hair is exactly the same type of hair as it was before. It is impossible for vellus hair to grow back thicker if the structure of the hair has not been changed. Whether you are shaving or waxing, vellus hair remains vellus and terminal hair remains terminal – it’s only our perception that makes it appear otherwise. While some facials may benefit any skin type, others are tailored to specifically address certain skin types and conditions, such as extremely dry or vitamin-deficient skin. Taking care of your skin can be overwhelming, but it doesn't have to be! Our skin care professionals can help you decide what facial treatments will best fit your needs personally and even design a program to maximize results either during a complimentary consultation or at the time of your appointment! Just about anyone is a good candidate for peels. All of our professional peels are designed to benefit certain skin types or conditions, and some are more aggressive than others. Don't be afraid to try a peel if you've never had one before! We start out with the appropriate peeling solution and acid concentrations, typically quite mild, and work up to stronger peels depending on your goals as well as your skin’s tolerance. Don't worry about which peel would best suit you personally - leave that part to us! Our skin care professionals can design a custom corrective peel program for optimal results during a complimentary consultation or at the time of your appointment. Acne "facials" are generally not aggressive enough to be very effective, so a chemical peel would likely be the best alternative for acne treatment. We offer clinical facial treatments and corrective peels for acne prone skin depending on the severity. Program packages are available for the treatment of acne, as it will take more than one peel to treat acne. Salicylic acid peeling solutions are typically incorporated because they help reduce the appearance of acne. Our Vivant skin care line features many products specifically formulated to treat acne and problematic skin types. An at-home regimen is highly recommended for best results. A series of chemical peels is often a very effective solution to correct sun damaged skin and uneven skin tone. Program packages are available, as it will take more than one peel to effectively treat hyperpigmentation. Salicylic acid peeling solutions are typically incorporated because they help reduce the appearance of acne. 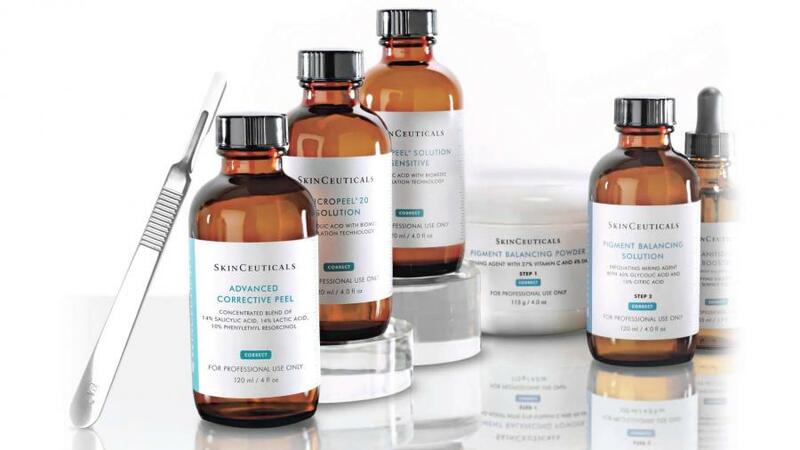 Both SkinCeuticals and Vivant skin care lines feature many products specifically formulated to treat discolorations and hyperpigmentation. An at-home regimen is highly recommended for best results. Excessive sun exposure without the protection of sunscreen causes the skin to age prematurely. Photoaging represents the characteristic changes caused by prolonged sun exposure. Photodamage essentially means the same thing and refers to damage to the skin caused by exposure to UV rays. Sun damage to the skin results accelerated aging -- wrinkles, sagging skin, roughness, leathery texture, discoloration, dark spots, hyperpigmentation, and broken blood vessels. We use SkinCeuticals, Vivant and Venus Skin products in our treatment rooms. All products are pharmaceutical-grade, high quality skin care products backed by science and proven clinical results. Various products are used during a treatment to cleanse, tone, prevent and correct, nourish, and protect the skin. These products are formulated specifically for certain skin types and conditions, so a custom variety of products will be incorporated to maximize results for you personally. Please inform our staff of any allergies or skin sensitivities you may have, but this is typically not an issue. Discontinue use of any prescribed topical medications or use of Vitamin A products such as Retin A and/or exfoliating creams at least 3 days prior to treatment. Avoid sun exposure for 7 days prior to treatment. If exposure is unavoidable, use a broad spectrum sunscreen of SPF 30 or higher on treatment sites. If you have a history of cold sores, fever blisters and/or herpes, you must contact your physician for an antiviral prescription and take the antiviral in the morning on the day of your peel. You must wait to have a peel if you are currently on Accutane®, or if you are pregnant or nursing. Post-treatment care following corrective peels will vary depending on the strength of the peel and the condition of the skin. Properly caring for and protecting your skin is always important, especially post-peel. Strictly follow your post-peel care instructions. You will receive everything you need to care for your skin post-peel with our more aggressive treatments. In general, wash your face morning and night with a gentle cleanser that is Alpha Hydroxy free. Keep your face soft with intensive moisturizers and avoid using any harsh products, such as retinol, for 2-8 days depending. Also avoid any abrasives such as scrubs/exfoliants for a week or so following a peel. NEVER pick or scratch at peeling skin; let it shed naturally. Most importantly, protect your skin daily with a broad spectrum sunscreen that is at least SPF 15 or higher. You will get the best results from your treatments by closely following your care instructions and using a quality skin care regimen that works hand-in-hand with your professional treatments daily. We use only cosmeceutical, or medical-grade, products in all of our professional treatments. Our products contain active ingredients that are clinically proven to work on correcting the skin. The active ingredients in our products -- such as retinol/vitamin A, vitamins C and E, glycolic, hyaluronic or lactic acids -- are scientifically proven to reach deeper layers of the skin where they are most effective. The concentration of active ingredients in over-the-counter (OTC) skin care products is limited to avoid harming people with the greatest sensitivity to those ingredients, and therefore, may contain very low concentrations of active ingredients. OTC, non medical-grade products may not produce results because there is not a very high concentration of the active ingredient(s) or because its active ingredient(s) cannot properly penetrate the skin. Watch out for businesses and brands that claim to have clinical treatments and products, as they may not truly be medical-grade quality. Corrective treatments and taking good care of your skin is an investment and does take commitment, but it’s all well worth it. Just make sure you are informed and getting the most for your money. And -- the at-home regimen may not cost as much as you think, too. Certain brands you may already be buying charge a premium for their well-branded product, regardless of the quality, or you may over-use your products because more is needed to see the benefits. With our products, a little bit goes a very long way. Quality products are extremely important and necessary for optimal results with regard to both at-home care and in-office treatments. Choosing to start an at-home skin care regimen along with our in-office treatments will get you the best results because our products and treatments are specifically designed to work together and complement each other to produce optimal results. Don't let skin care overwhelm you; we can help you choose the absolute best products for you personally and even get you started with what you need most and add products along the way if needed. Of course you do not have to! However, choosing to commit to an at-home skin care regimen using one of our brands in conjunction with your treatments will get you the best results. You will also see results faster because your skin care products are designed to work together with your treatments. to achieve a healthy skin. 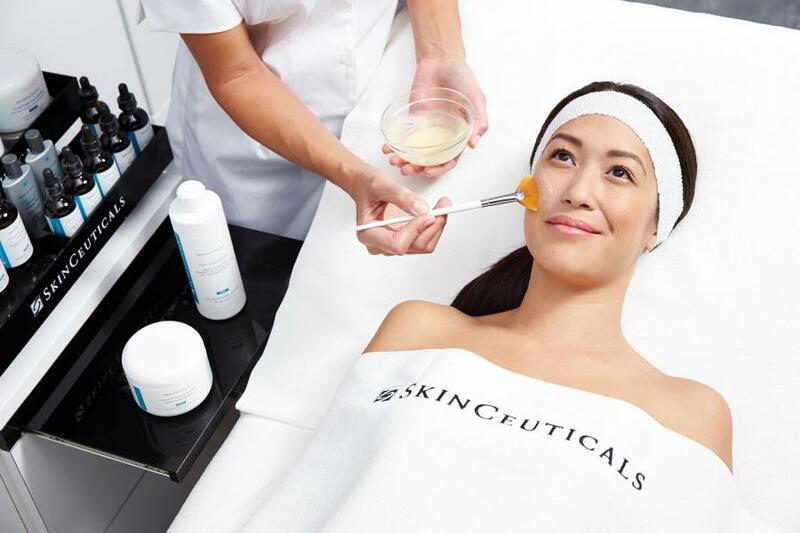 Regular and appropriate use of a personalized medical-grade regimen paired with your professional treatments will help you achieve optimal results and maintain a healthy skin. Take advantage of a complimentary consultation with one of our skin care professionals and make it simple. We will work with you on an individual basis to discuss your goals, evaluate your skin, and help you determine what treatments and/or products are best for you personally to achieve your goals and get your skin looking its best!